Sweet fairies, blooming flowers, garden creatures -- take a step into a magical new world with these enchanted garden designs! Fantasy comes to life with this amazing collection of designs. 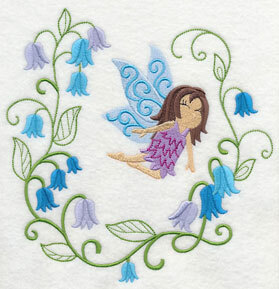 Adorn pillows and totes with a sweet fairy garden scene. 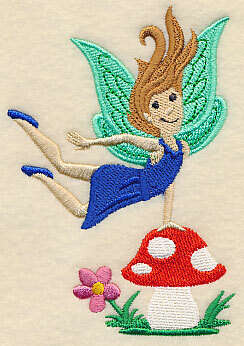 Or stitch one of the wide variety of fairy designs (think dress forms, sketch-style, and more!) 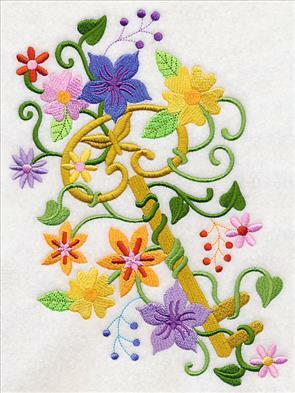 on a quilt or wall hanging. 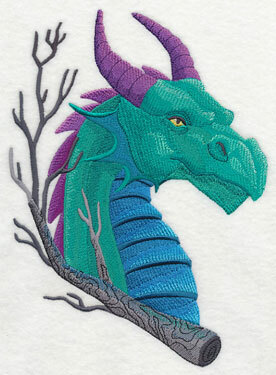 New unicorn and dragon portraits showcase the beauty and majesty of these magical creatures. 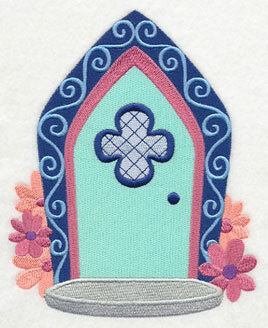 Plus, fairy garden doors, new lace designs, and so much more! 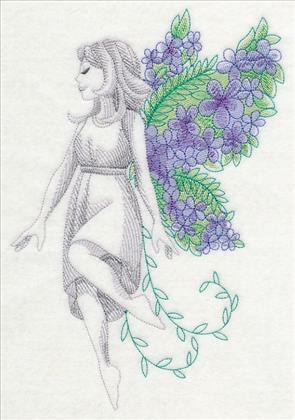 Scroll down the page to find these amazing designs, and order today! 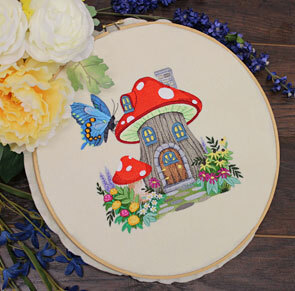 A hand embroidery hoop frames this intricate toadstool design beautifully. 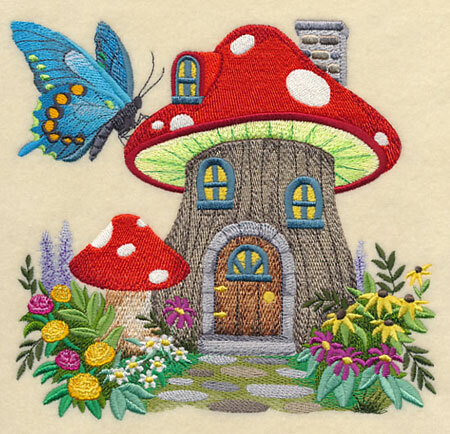 Even the butterflies in this fairy garden can't resist taking a peek at this adorable toadstool house! Blooming flowers and lush greenery fill this scene with the beauty of an enchanted garden. 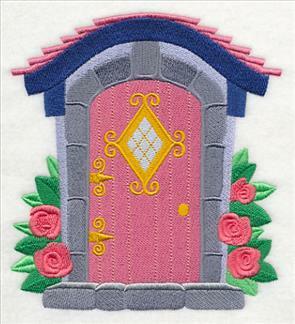 7.46" x 6.92" and 6.33" x 5.87"
Any fairy would adore living in this whimsical flowerpot house. 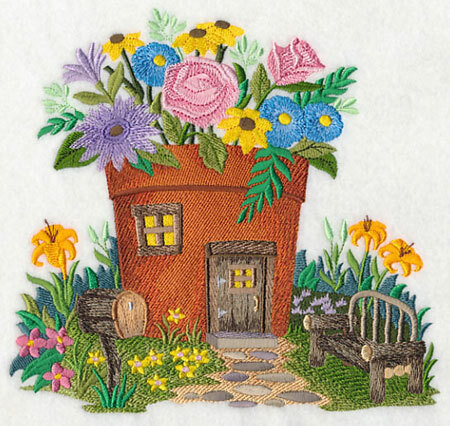 The miniature scene mesmerizes on pillows, quilts, and wall hangings. 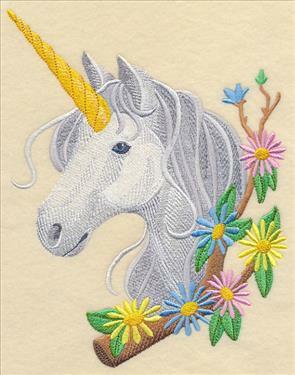 7.33" x 6.90" and 6.20" x 5.84"
A majestic dragon stares off into the enchanted forest next to a fire-scorched tree branch; a beautiful unicorn sits amongst lovely flowers. These magical creatures stun on tote bags, pillows, and more. 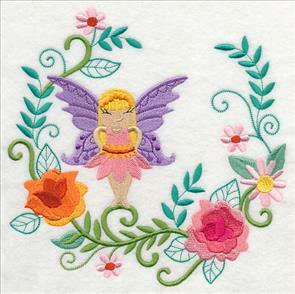 6.91" x 8.87" and 5.86" x 7.52" and 4.86" x 6.24"
Various shades and styles of leaves make up the beautiful fairy outfit on the left; brilliant flower petals in purple and pink create the dress on the right. 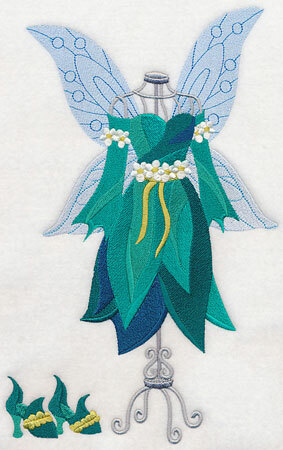 Stitch these fairy dress forms on tote bags, framed art, and more! 6.88" x 10.83" and 5.83" x 9.18"
6.30" x 10.84" and 5.34" x 9.19"
4.52" x 7.79" and 4.00" x 6.90"
Unlock the doorway to another world with these flowering and flourishing enchanted keys. 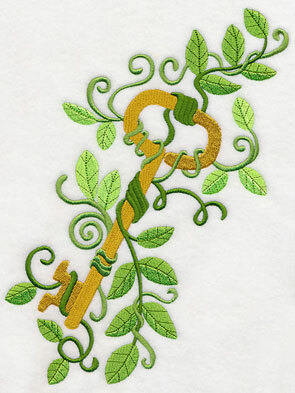 Vines and flowers intertwine with the intricate detail of the keys -- embroider on purses, jacket backs, and quilts. 6.90" x 9.01" and 5.99" x 7.81"
5.39" x 7.03" and 4.85" x 6.33"
6.91" x 9.66" and 5.59" x 7.81"
4.85" x 6.78" and 2.81" x 3.78"
A light fairy in the classic sketch style gives these magnificent floral wings all the attention. Perfect for pillows, tote bags, and more. 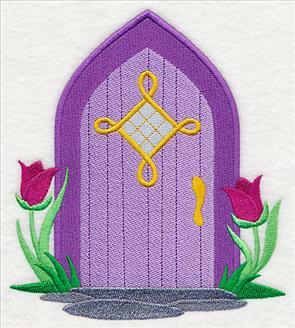 6.88" x 9.91" and 5.85" x 8.42" and 5.19" x 7.48" and 4.72" x 6.80"
Open a doorway into another world with these adorable fairy garden doors. 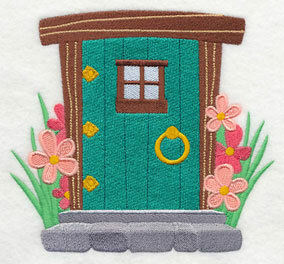 Modeled after the garden decorations that transform any tree or flowerpot into a fairy home, these doors are beautiful on pillows, totes, and more. 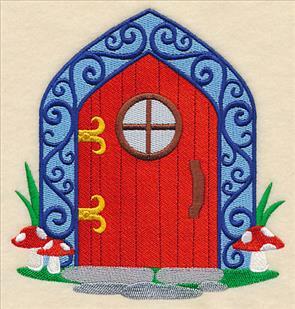 5.85" x 6.44" and 4.85" x 5.34" and 3.51" x 3.87"
Each of the fairy door features distinctly different accents and details to add personality to your projects. Flowers, leaves, and butterflies are only a few of the bright and colorful ways they differ. 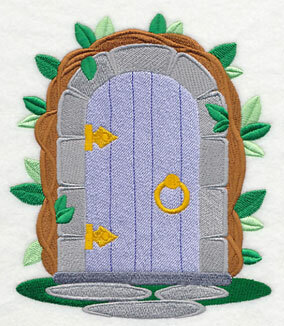 6.45" x 5.86" and 5.35" x 4.86" and 3.87" x 3.51"
Use all nine of the fairy garden doors on a quilt, or pick your favorites to stitch alone. 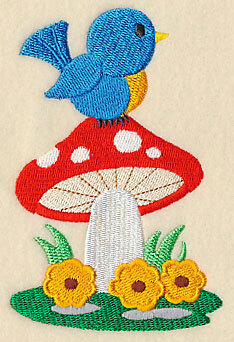 Terrific on wall hangings, framed art, or fabric storybooks! 5.86" x 6.82" and 4.86" x 5.66" and 3.32" x 3.86"
The arches, pathways, and windows found in the fairy garden doors give them each a unique look, yet similar styles and accents keep them cohesive. Bring fantasy to life with these magical designs! 5.85" x 7.17" and 4.85" x 5.94" and 3.15" x 3.86"
Give home decor items, garden decorations, and more a whimsical feel with these garden doors. 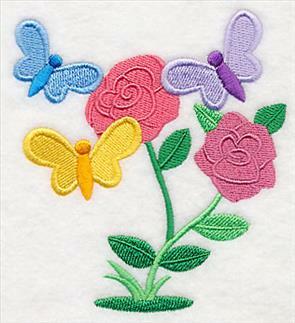 Pick your favorite to stitch on your next embroidery project. 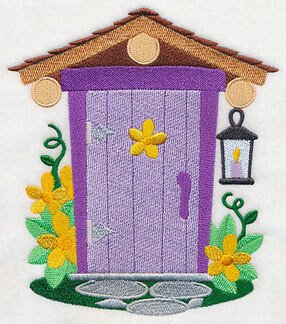 5.86" x 6.17" and 4.86" x 5.12" and 3.67" x 3.87"
Purchase these intricate fairy garden doors individually by clicking the links above, or get all 9 of the designs in a pack. Create the perfect pillow to accompany any bedtime story with this magical project. 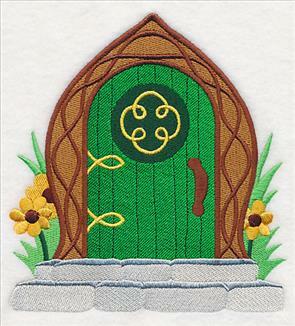 A handy pocket holds your favorite fairy tale, while the front panel opens to reveal a hidden design inside. 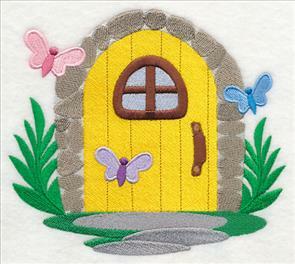 We added a fairy garden door design to the front of the panel as a gateway to discover the sweet fairy inside. Get the written project tutorial for this pretty pillow. 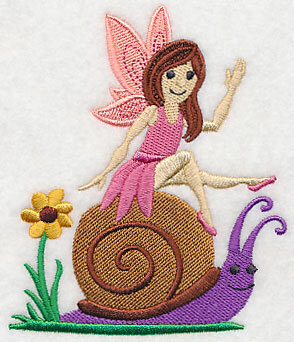 Stitch an entire fairy garden on your next embroidery project with these whimsical designs! 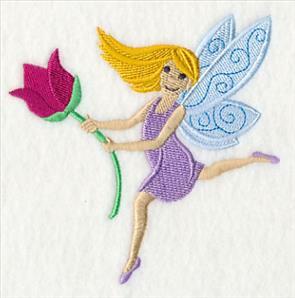 Garden elements and sweet fairies combine to continue the enchanted garden theme on pillows, quilts, wall hangings, and more. 3.23" x 4.61" and 2.69" x 3.85" and 2.10" x 2.99"
Each of the fairy garden designs has been sized to coordinate with the fanciful fairy garden doors featured above. 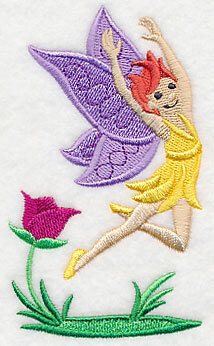 Stitch the two types of designs together to make an entire garden scene, or stitch these fairies alone. 4.62" x 4.62" and 3.85" x 3.86" and 3.01" x 3.01"
Beautiful flowers, tree stumps, and sweet birdies fill these designs with the beauty of the outdoors. Add to kids' projects, gardening gear, or apparel. 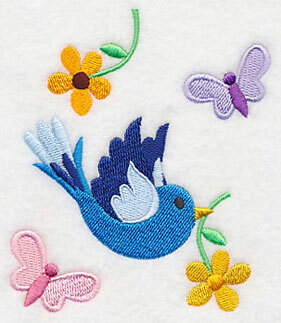 4.18" x 4.51" and 3.19" x 3.45" and 2.32" x 2.51"
Fun and playful birds and butterflies are the perfect way to add a blooming look to your next project. Bright colors and simple shapes give these designs a light-hearted, charming style. 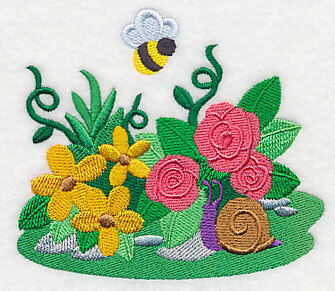 4.13" x 4.51" and 3.44" x 3.76" and 2.75" x 3.01"
Finish off these garden designs with a bunch of blooming flowers accented with a sweet bumblebee and colorful snail. Terrific for a wide variety of projects! 4.37" x 3.80" and 3.65" x 3.22" and 3.04" x 2.68"
Purchase the sweet fairy garden designs individually by clicking the links above, or get all 9 of the designs in a pack. 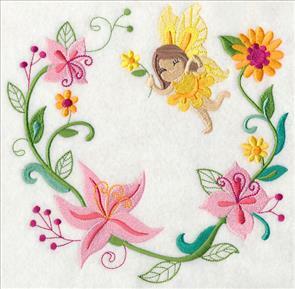 Md - Designs smaller than 4" x 4"
Add a light and fanciful fairy wreath to your next project for a cute and charming update! 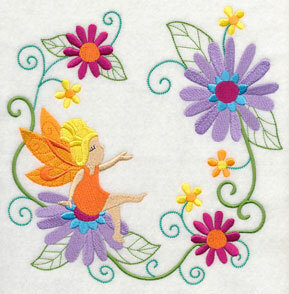 Especially great on kids' gear, these adorable fairies will add a burst of color to your next embroidery project. 5.90" x 5.88" and 4.89" x 4.87"
Each of the wreaths feature a garden flower. Above you see bluebells and lilies; here carnations and daisies bloom. 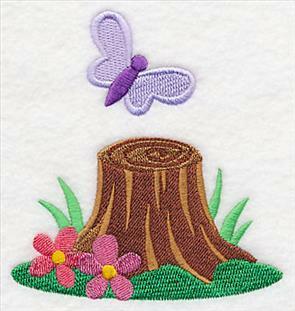 Stitch the sweet wreaths on quilts, pillows, or backpacks. 7.81" x 7.79" and 6.92" x 6.91"
5.89" x 5.88" and 4.88" x 4.87"
A fierce dragon gets an elegant makeover in this fabulous freestanding lace design. 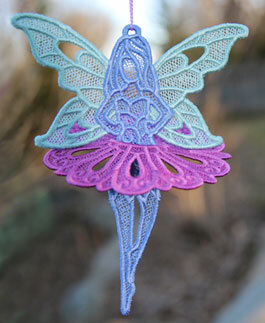 Hang the charming fairy in your window, from a light fixture, or even from a tree in your garden to see her fly through the air with ease. 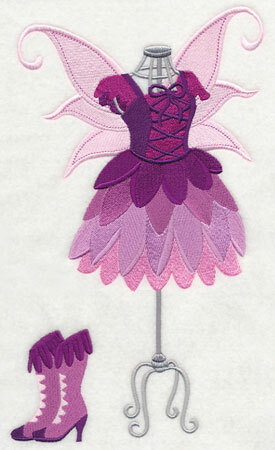 The wings of the dragon and the fairy's skirt attach to their bodies after being stitched to give a unique, 3D look. 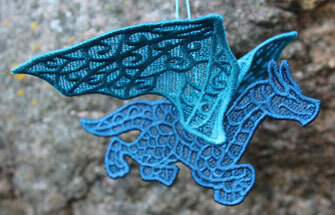 See how to make the majestic fire-breather here, and the fanciful fairy here. 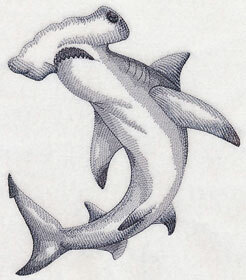 4.88" x 6.30" and 3.04" x 3.90"
Kathryn was looking for shark designs to embroider on projects for her great-grandson, and requested we add a few to the current selection at Embroidery Library. We love how the majestic creatures look in the classic sketch-style. Thanks for the idea, Kathryn! 11.75" x 4.94" and 9.40" x 3.95"
6.75" x 7.80" and 5.84" x 6.75" and 4.85" x 5.61"